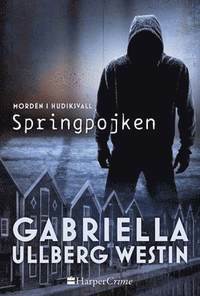 While in Denmark for Krimimessen Horsens 2017, I had the pleasure of sitting down with Swedish crime writer Gabriella Ullberg Westin to discuss her books, her writing career, and much more! It was just plain fun talking with Gabriella - I enjoyed every minute of our conversation. Gabriella’s books are currently being shopped around to English language publishers, so consider this your chance to be one of the first in the U.S. or U.K. to learn about her! Read on for more about Gabriella, including the incredibly sweet story of how her husband helped her fulfill her dream of writing a crime book, and the impressive research that Gabriella has put into her novels. Plus plot information for her books! Thank you to Gabriella for answering my questions so thoughtfully, and to Mette from HarperCollins Nordic for organizing this interview! Gabriella always loved writing, ever since she was a young child. Growing up, classes that involved writing were always her favorite. She loved creating her own worlds and characters. When she was in college, a professor told her she should become a writer, but at that point this dream seemed so far-fetched - she never imagined she could get there herself. Reading Henning Mankell’s FACELESS KILLERS made her realize she would like to be a crime writer someday, too! She was inspired by the many great Swedish female writers who have gone before her, and who are still writing today. Their success made her begin to believe that she could achieve this dream, too. In her professional career before becoming a writer, Gabriella worked in marketing and communication. She also studied fashion design and criminology! She believes very strongly in researching thoroughly before she begins writing, and she continues to be eager to learn more about criminology and police work. HOW DID SHE BEGIN WRITING? Just a note that Gabriella’s story of how she began writing must be one of my favorites I’ve ever heard! While she was on maternity leave, she had an idea that she thought might finally be the right idea to use for a book - but she couldn’t figure out how to get started. She tried and tired, but she was just stuck. She and her family were traveling on a flight, going on vacation to the Canary Islands, and her husband noticed that the famous Swedish crime writer Mari Jungstedt was on their flight! She didn’t notice at all. When they arrived at their vacation spot, her husband (without her knowing!) approached Mari and explained her situation - that she was an aspiring writer, and that she wanted to write a crime novel but didn’t know how to get started. It was Gabriella’s birthday coming up, and her husband gave her the best surprise: he arranged a surprise meeting between Gabriella and Mari! Mari invited Gabriella back to her vacation house, and the two spent an evening sitting on her porch, looking out on the beautiful scenery, and talking about writing crime fiction. Mari gave Gabriella fantastic advice: she advised Gabriella to stop thinking about how to start. Instead, focus on a strong memory that you have and start from there, and then the story will flow. Her books combine well-researched crime fiction with a romance angle. She wanted to do something different, and she decided to inject her crime stories with romance. Her main character is named Johan Rokka. He’s a police officer working in her own hometown of Hudiksvall. Rokka was originally from Hudiksvall, but moved away from this town many years ago, when his high school love disappeared without a trace. Rokka is a turbulent and extroverted person - he’s very social on the outside, but inside he is very vulnerable and wounded, due to his past. Her husband is a police officer, so in many ways, Rokka is inspired by him. She began to wonder what would happen if her husband were put into different situations, and that’s where the idea for Rokka came from. Rokka has a colleague named Janna Weissmann, who is a forensic scientist. She’s quite the opposite of Rokka: she’s very professional, an introvert, and sometimes a bit of a loner. In many instances, the ex-convicts told her that it was a lack of male role models that caused them to explore gang life, and become embroiled in crime. She created her main character with this research in mind - her main character has a criminal past as well, and the story of his past mirror the experiences of many of the men she met with. I was truly inspired by Gabriella’s outlook on meeting with these men. She was so grateful for the perspective they shared with her, and she spoke so highly of their bravery and strength in turning their lives around and escaping gang life. I was also blown away by this level of commitment to researching her books! Her writing process relies very heavily on planning. When she begins writing a new book, she creates a very detailed outline that describes every single scene in the book in one or two sentences. This process usually takes two or three months. After that part of the process is complete, she goes through and writes out the whole story. The day after her student graduation party eighteen year old Tindra Edvinsson is found stabbed to death on the lookout at Köpmanberget. The murder is very reminiscent of a case twenty years ago when a young woman disappeared without a trace from the same place and after her graduation party. Detective Inspector Johan Rokka gets the information and painful memories rise - the missing woman was his childhood sweetheart Fanny - and in parallell with the investigation, he begins to unravel in the old case. Rokka himself is hiding a criminal background from his youth, now he finds himself in contact with the rough criminal world he chosed to leave. Suddenly he is once again face to face with a person he most of all wants to forget. Rokka could identify with the gang’s young errand boy, Eddie. Rokka knows what type of hell this young boy is put through, he knows Eddie and has seen it coming. The mechanisms behind becoming an outlaw are deeply rooted in Rokka’s mind, he broke the evil pattern, but will Eddie do it? And how far will Rokka have to go to leave his former life behind for good? In The Fixer, we follow, as usual, gruff detective sergeant Johan Rock and his quieter but highly competent female colleague, Janna Weissmann, from Hudiksvall Police Department. The Fixer is a crime novel based on the theme of "social engineering" - that is, how social skills can be used to manipulate others into giving up sensitive information or committing criminal acts. This is a form of criminality against which it is extremely hard to protect oneself, since the crime, by its very nature, involves a person failing to detect that he or she is being manipulated. GABRIELLA ULLBERG WESTIN (b.1973) was born and raised in Hudiksvall, a town north of Stockholm in Sweden. She previously lived in Italy, where she worked as a model and as a fashion designer. Today she lives in Stockholm with her husband who is a policeman, and their two children. Read more about author at www.gabriellauw.se.